This is an exquisitely designed Formal Japanese Woman’s Topcoat intended for wear at very sophisticated functions. It encompasses all of the most extraordinary artistic endeavors of Japan’s greatest Master Artists. The hand weaving, the hand dying, and the incredible embroidery all represent the finest examples of these arts. Additionally, the inner hand woven Silk lining has been hand dyed using the difficult art of Shibori. This Woman’s Haori represents the best of “Couture” wear from 1800s Japan; and was undoubtedly intended for wear at the most elite functions that the nobility would attend. 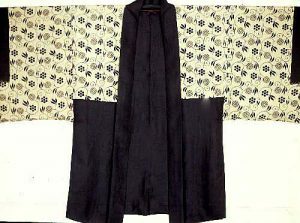 It is a three quarters length, open overcoat which gives the effect of being a short Kimono. 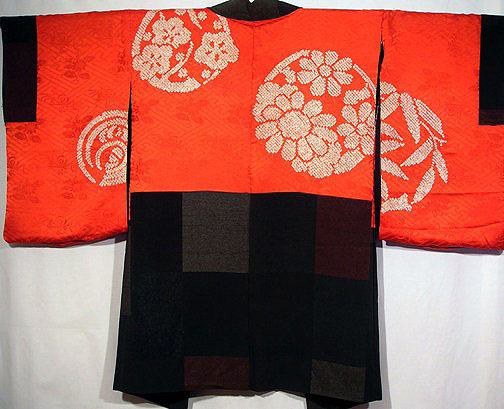 In Women’s Haori, as opposed to Men’s, the main design typically appears on the outside of the overcoat. 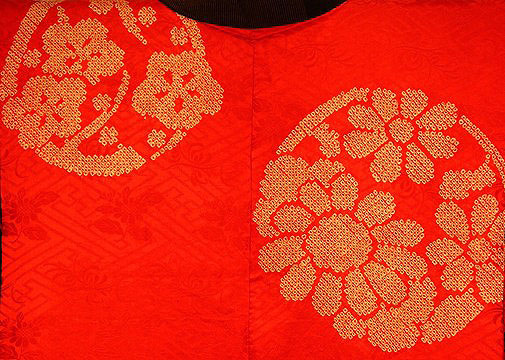 Although these garments served a practical use for the original owners, it was the art that made the Haori a family heirloom: everything about this fabulous garment makes it unique and impossible to duplicate. It is a colorfully and magnificently hand woven semi gauze silk weave. 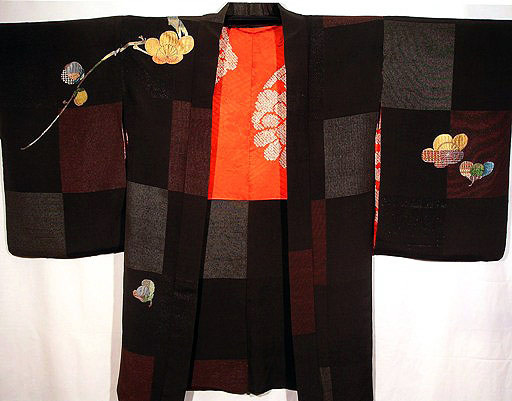 The Master Weaver, who was commissioned to create this glorious Haori, was an artist at his craft. The overall garment contains an intricate mixture of ground pattern and overlaid motifs. 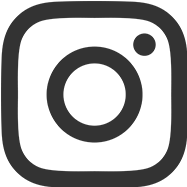 The background weave consists of alternating handwoven rectangles consisting of various colors highlighting the “checkerboard” effect of the design, referred to as Somewake . This layout was most typical of designs dating back to the Noh Costumes of the Edo Era; and, most particularly, is reminiscent of the Kanbun portion of the Era (1661-1673). On this magnificent backdrop, the Master Embroiderer has utilized a variety of stitches to float a pattern of an elegantly embroidered flower and fruit laden branch, dramatically overlying the shoulder and continuing onto the back and sleeves. 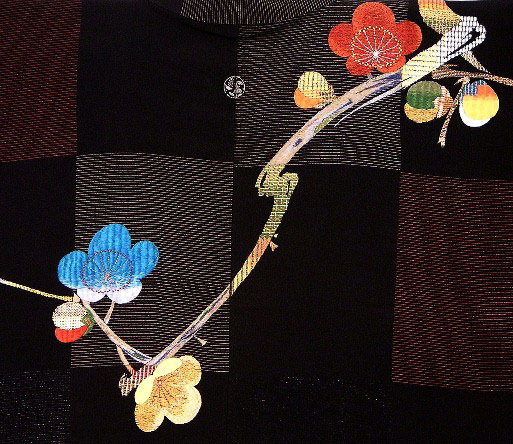 Using a realistic image as a design motif to override the design zones of the Somewake, also began in the Kanbun Era when larger motifs were arranged in fluid compositions such as the use of this plum pattern as it flows from the front of the garment over the shoulder onto the back of the Haori. 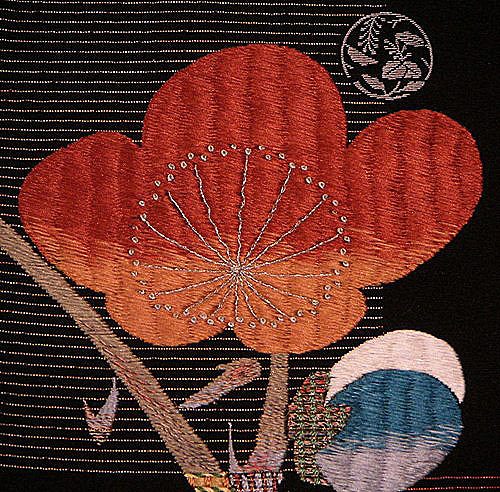 The use of the Plum (“Ume”) motif tells us much about the woman who wore this Haori. Because the Plum flowers early in the year, before the end of winter, it is greatly admired for its strength amidst adversity; as well as for its role as a herald for spring. Its flower is admired for its beauty and delicacy and its succulent fruit was edible and used medicinally. As is the case with the checkerboard pattern, the Plum design was particularly fashionable in earlier times when it was extolled in Japanese poetry. 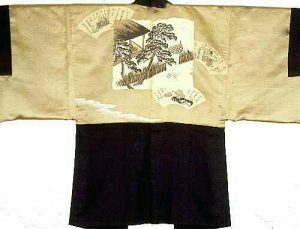 Also incorporated into the outer design of the Haori is the placement of three Family Crests (“Mon”) which appear to be a highly stylized version of the Paulownia (“Kiri”), the most popular of all Japanese crests and one that was restricted to the Imperial Household. Seldom was the crest included on women’s garments, unless the wearer came from a family of noble standing. 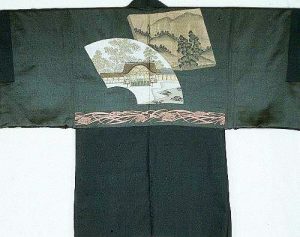 The fabulous lining of this Haori exhibits the “Shibori” technique of tie dying that has been adapted to Japan in a very original manner. This method requires that each and every circle that forms the design of this stunning Haori, be created by tying a small section of fabric off with silk thread into a balloon shape about the size of one’s little fingernail. The small dot pattern exhibited in this Haori is known as the “fawn-spot” tie dye design or “Kanoko Shibori.” The slight ripple effect, which is felt rather than seen, is a result of the binding off of each small dot. To add to the already masterful dying, the artist created an inner pattern of blossoms, leaves and flowing streams. 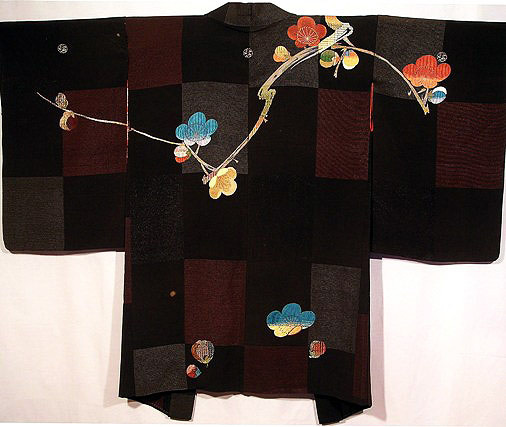 This exquisite workmanship proclaimed that the dyer of this Haori lining was not only proficient at Shibori, but was also a master craftsman in order to tie off individually the darker circles of the pattern within the pattern. 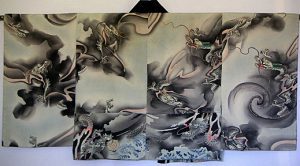 The theme of the Plum (“Ume”) blossoms and leaves is carried through onto the Silk Lining. The outer colors used in creating this magnificent Artwork, as well as the design motifs indicate that a woman of great wealth and high social standing would have worn it in only in the late months of winter and the early months of spring. 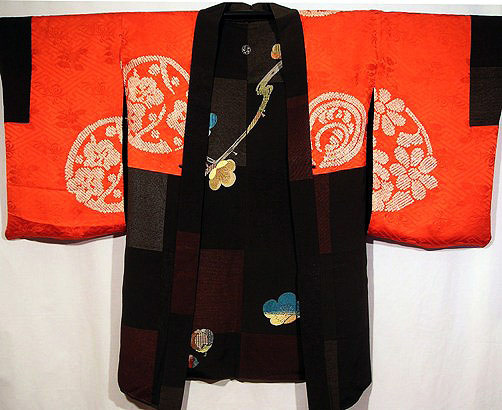 Woman's Haori or Topcoat, designed for Formal occasions. Meiji Era (1868 – 1911), Prior to the turn of the Century. Extraordinary hand woven, gauze-like, shiny Silk with an inner lining of hand woven Silk that has been Shibori tie-dyed. In excellent condition. To hang as a work of art, or to wear for a very wonderful occasion.